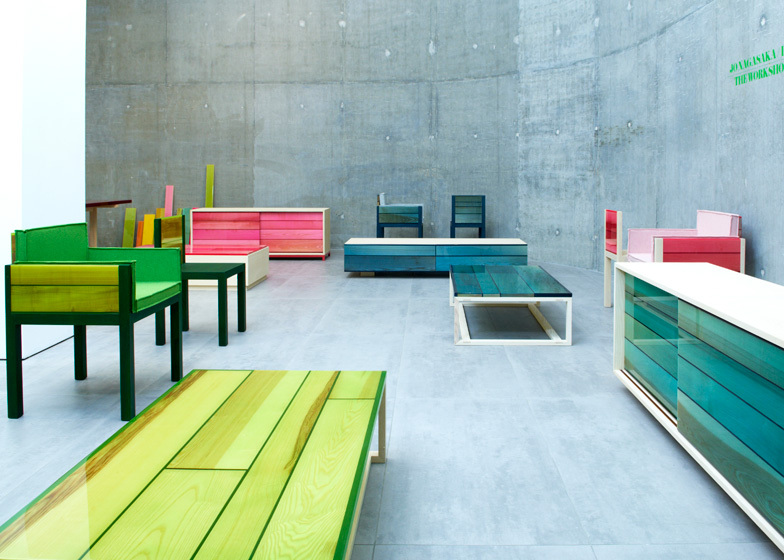 London Design Festival 2013: Japanese architect Jo Nagasaka has developed a range of resin and wood furniture for Established & Sons. Jo Nagasaka of Tokyo practice Schemata Architecture Office peels away parts of the surface of Douglas fir boards to expose the grain, before encasing the wood in brightly coloured epoxy resin. The addition of the resin transforms the uneven texture of the wood into a smooth and practical surface, while variations in the depth of the peeled wood affect the intensity of the resin's colour. The new coffee table, side table, credenza and chair combine the resin-covered wood with simple geometric frames to create updated variations on a project that Nagasaka presented at the Milan Furniture Fair in 2011. Amsterdam designer Roel Huisman is also showing a desk made from resin with a lamp and vase embedded in its surface during LDF, while Tord Boontje has created a series of resin surfaces covered in patterns created using magnetism. Photography is by Colin Streater.